Airborne's parents are oil-rich Navahos who indulged their eldest son with sky-diving lessons. Talltree also studied law and passed the Arizona State Bar exams. Joined the army and opted for airborne . . .
Destro is the faceless power behind MARS (Military Armaments Research System), largest manufacturer of state-of-the-art weaponry. 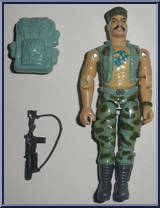 To Destro, war is man's most natural state: the fittest survive and th. . . Graduated from Harvard Medical School, completed residency at Johns Hopkins. 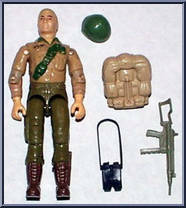 Hoped for a guarantee of a G. I. Joe assignment upon enlistment. Told flatly that the Army made no such deals. Doc enlisted. . .
Born into a large back-swamp Cajun clan. Gung-Ho moved to New Orleans and won a reputation as a bare-knuckle brawler and knife-fighter to be reckoned with. 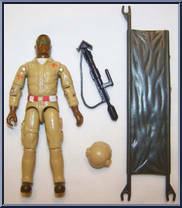 Joined the Marines at 18 and graduated top o. . .
Bludd received initial military training in the Australian Special Air Service. 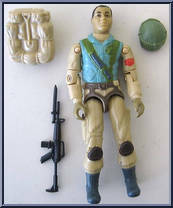 Later joined the French Foreign Legion. Worked as military advisor in a number of countries and is currently wanted for . . . 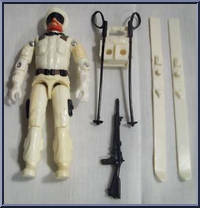 Snow Job was a major Olympic Biathalon contender. He enlisted initially for the special training and support privileges that the army gives to Olympic champions. However, to the consternation of army . 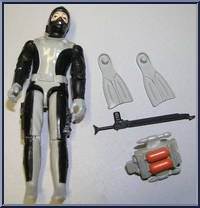 . .
Torpedo was a scuba instructor prior to enlistment. Attained black belts in three martial arts by 19 (Wu-Shu, Kenpo, and Go-Ju-Ryu). Proficient with Filipino butterfly knife (Bali-Song). Training rec. . .
Tripwire dropped out of high school at a naval base in Yokosuka, Japan (Father is career navy). Spent two years in a Zen monastery pondering the meaning of life. Expelled for breaking too many dishes . . .